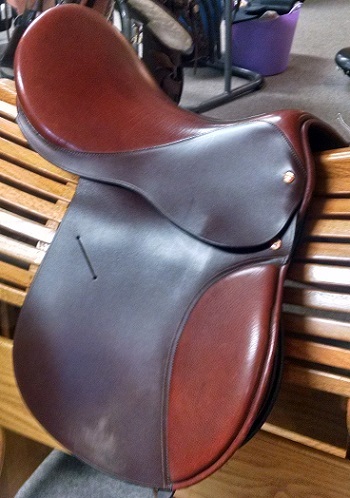 The Cross Functional saddle correctly supports either flat work or jumping. It is also a trail- and distance-rider favorite. The generous flap permits the straighter leg and correct balance required for flat work while enabling a very balanced jumping position. The knee blocks and optional calf blocks under the saddle flap are on Velcro for easy repositioning or removal. The ReactorPanel Saddle is a revolutionary design! The saddle sits on two panels- one on each side of the spine - which are designed to move with the horse. The panels attach to the saddle tree with four shock absorbing discs that have Velcro on each side AND the saddle rests on the panels in the center (roughly under the twist) - it is not "suspended" in the air. The discs can be repositioned easily, making it possible to get a custom fit for your horse. The front to back balance is achieved by using different sized discs, and it's often possible to adjust the saddle to compensate for lack of symmetry or muscle atrophy in your horse. The ReactorPanel was created from the ground up to provide the greatest possible comfort for the horse. In a ReactorPanel saddle, performance is enhanced because the horse is able to more fully use its range of motion medially and laterally. Because the ReactorPanel saddle allows for greater freedom of shoulder movement (allowing for expansion as well as rotation), the stride typically lengthens and all gaits tend to improve. The distribution of the rider's weight via the large surface area of the ReactorPanels is enormously beneficial in all disciplines. May have some wear from light demoing.